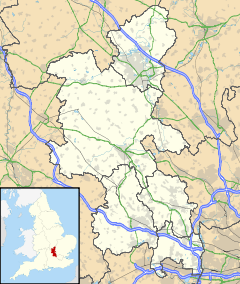 Upper Winchendon or Over Winchendon is a village and civil parish in the Aylesbury Vale District of Buckinghamshire, England. It is about 1.5 miles (2.4 km) south of Waddesdon and 4.5 miles (7 km) west of Aylesbury. A mid-air collision between a plane and a helicopter just outside the village led to the Waddesdon Manor air incident on 17 November 2017. The name "Winchendon" is derived from the Old English for "hill at a bend". Collectively the villages of Upper Winchendon and Nether Winchendon (or Lower Winchendon) were called Wichendone. The manor of Upper Winchendon was held by the convent of St Frideswide in Oxford, to whom it was given by King Henry I. After the suppression of the convent in the Dissolution of the Monasteries the manor was given to Cardinal Wolsey, but was seized by the Crown shortly afterwards in 1530 along with Wolsey's other estates. In 1623 the manor was granted by the Crown to the Goodwin family, who enlarged the manor house into a mansion. It then passed into the Wharton family, one of whom was made the Duke of Wharton in 1718 for his services to the Crown. He later had all his possessions seized for being a supporter of the Young Pretender (Bonnie Prince Charlie), after which time the house fell into disrepair and has since been demolished. Cardinal Wolsey (1473–1530), cardinal and politician, was briefly lord of the manor up to 1530, when he fell from favour. Sir Francis Goodwin (1564–1634), politician, was lord of the manor of Upper Winchendon and an MP for Buckinghamshire. Arthur Goodwin (died 1643), lawyer and Parliamentarian, was lord of the manor of Upper Winchendon. Philip Wharton, 4th Baron Wharton (1613–1696), soldier, Parliamentarian and art collector, gained the manor of Upper Winchendon through his second wife, Jane Goodwin, only daughter of Arthur Goodwin. He and other family members were painted by Anthony van Dyck. Samuel Clarke (1626–1701), Nonconformist minister and Biblical scholar, spent 26 years in Upper Winchendon under the auspices of Philip Wharton, after his ejection from the rectory of Grendon Underwood in 1662, and set up on an Independent congregation there. Thomas Wharton, 1st Marquess of Wharton (1648–1714), Whig politician, rake and Lord Lieutenant of Ireland, was the eldest son of Philip Wharton. The lyrics of the marching song "Lillibullero" are attributed to him. He was buried at Upper Winchendon. Goodwin Wharton (1653–1704), Whig politician and autobiographer, was born in Upper Winchendon on 8 March 1653, the third son of Philip Wharton. Anne Wharton (1659–1685), wife of Thomas Wharton, was a poet and dramatist. ^ "Aircraft and helicopter involved in mid-air crash in Buckinghamshire". The Guardian. 17 November 2017. Retrieved 17 November 2017. A spokesman for the nearby Wycombe Air Park confirmed both aircraft had come from there. A representative of Waddesdon Manor, a large estate near Aylesbury, said the crash happened near the village of Upper Winchendon, a little beyond the manor grounds. ^ History of Parliament. Retrieved 13 March 2014. ^ ODNB: Joan A. Dils, "Goodwin, Arthur (d. 1643)" Retrieved 13 March 2014, pay-walled. ^ ODNB: Sean Kelsey, "Wharton, Philip, fourth Baron Wharton (1613–1696)" Retrieved 13 March 2014, pay-walled. ^ ODNB: David Wilson, "Clarke, Samuel (1626–1701)" Retrieved 13 March 2014, pay-walled. ^ ODNB: J. Kent Clark, "Wharton, Thomas, first marquess of Wharton, first marquess of Malmesbury, and first marquess of Catherlough (1648–1715)" Retrieved 13 March 2014, pay-walled. ^ ODNB: Roy Porter, "Wharton, Goodwin (1653–1704)" Retrieved 13 March 2014, pay-walled. ^ ODNB: Germaine Greer, "Wharton , Anne (1659–1685)" Retrieved 13 March 2014, pay-walled. Page, W.H., ed. (1927). "Upper Winchendon". A History of the County of Buckingham, Volume 4. Victoria County History. pp. 122–125. Pevsner, Nikolaus (1960). Buckinghamshire. The Buildings of England. Harmondsworth: Penguin Books. pp. 273–274. ISBN 0-14-071019-1. Wikimedia Commons has media related to Upper Winchendon. This page was last edited on 1 November 2018, at 14:57 (UTC).